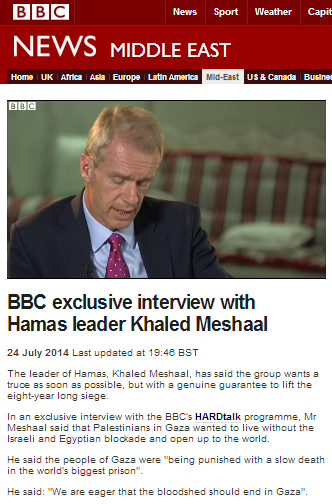 On July 24th the BBC News website’s Middle East page featured an excerpt from what it termed an “exclusive” ‘Hardtalk’ interview with Hamas’ Khaled Masha’al who of course resides very comfortably in Qatar. If audiences were expecting the BBC’s representative Stephen Sackur to fulfil the corporation’s mission of cutting through Hamas slogans and propaganda in order to bring them accurate and impartial information which would help them reach informed opinions and enable them to “participate in the global debate on significant international issues“, they would have been sorely disappointed. Now obviously Khaled Masha’al is lying (unhindered) through his teeth in every single answer here and – difficult as it must be to interview a compulsive liar so disconnected from reality – if the BBC is not going to challenge Masha’al’s blatant falsehoods and cut through his propaganda, then the obvious question must be what journalistic value does such an interview have in the first place? If Israel and Egypt lift the blockade and ease border restrictions, will Hamas rearm itself with missiles and weapons imported from Iran, Libya and elsewhere as it has done in the past? Will it import concrete and other materials in order to reconstruct its attack tunnel network currently being destroyed by the IDF? Will foreign aid money for the rehabilitation of Gaza be commandeered for reconstruction of terrorist infrastructure? If Hamas is so worried about the effects of the blockade on the people of Gaza, why did it not stop carrying out acts of terrorism itself and facilitating terrorism by other groups which are the reason for the implementation and continuation of the blockade and border restrictions? Why did Hamas breach the ceasefire agreement of November 2012 and why did it initiate this current escalation? If you, Khaled Masha’al, reach a ceasefire agreement with Israel, can you ensure that Mohammed Deif will honour it and do you – based as you are in Qatar – actually have any control over Hamas’ armed militia? Why should Israel open its borders and allow people from Gaza to work in Israel given the history of terror attacks and suicide bombings carried out by workers from Gaza in the past? Are you eager to stop the bloodshed in Israel as well as in Gaza? Will you stop all acts of terror against Israelis for good? Sackur, however, failed to present anything approaching a robust challenge to Masha’al’s blatant lies. Hence, this interview joins the previous items of BBC content in the category of one-sided, context-free promotion and amplification of Hamas’ demands. This morning on Today they put it to the guy from UNWRA re Beth Hanoun that Israel says they did give a window. (Israel statement yesterday said the UNWRA guys statement that they did not, is a flat out lie.) The UNWRA guy was asked to reiterate clearly whether or not Israel granted a window. He said emphatically: They did not. I used to have respect for Stephen Sackur but it has evaporated over the last two years. He is obviously afraid to ask Masha’al difficult questions. Tim Sebastian was not such a coward.